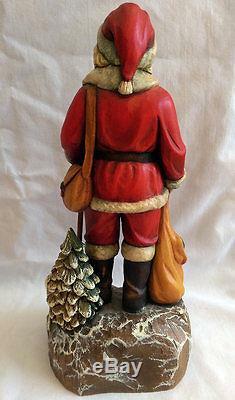 Up for sale is one (1) Vintage ANRI B. Shackman Santa Claus hand carved wooden figure / statue. #4 The figure measures approximately 9 1/2" high by 4 3/4" wide by 4 deep and is in excellent condition with no visible damage. Made in Italy, this rare, exquisite figure was designed by artist B. Shackman circa 1988 in limited edition and is numbered 228/500. 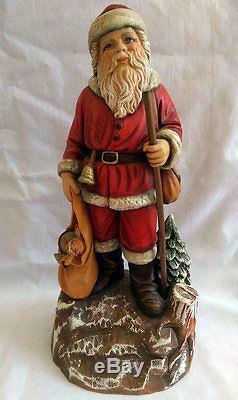 The statue depicts Father Christmas with a staff holding a sack of toys. NOS store stock from my parents gift shop has been in storage for over 20 years. Comes with original box and small ANRI pamphlet. 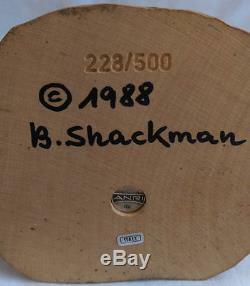 The item "Vintage ANRI B Shackman 9 1/2 Wooden Santa Claus Figure 1988 Christmas 228/500" is in sale since Thursday, August 24, 2017. This item is in the category "Collectibles\Decorative Collectibles\Decorative Collectible Brands\ANRI". The seller is "holidaystreasures" and is located in Lewes, Delaware. This item can be shipped to United States, Canada, United Kingdom, Denmark, Romania, Slovakia, Bulgaria, Czech republic, Finland, Hungary, Latvia, Lithuania, Malta, Estonia, Australia, Greece, Portugal, Cyprus, Slovenia, Japan, China, Sweden, South Korea, Indonesia, Taiwan, Thailand, Belgium, France, Hong Kong, Ireland, Netherlands, Poland, Spain, Italy, Germany, Austria, Russian federation, Israel, Mexico, New Zealand, Philippines, Singapore, Switzerland, Norway, Saudi arabia, Ukraine, United arab emirates, Qatar, Kuwait, Bahrain, Croatia, Malaysia, Chile, Colombia, Costa rica, Panama, Trinidad and tobago, Guatemala, Honduras, Jamaica.